The South African economy suffered a fiscal loss of R6.4-billion ($492-million) in 2017 due to illicit alcohol activities that generate an annual revenue of R12.9-billion and goes unregulated, asserts a new Euromonitor International Study. The study, which engaged local manufacturers, trade associations and government, among other relevant stakeholders, highlighted that the largest share of the fiscal loss was attributed to smuggling of final alcohol products and raw ethanol used in the production of alcohol, amounting to R2.4bn. Tax leakage is the next highest contributor to the fiscal loss in 2017 at R2bn. 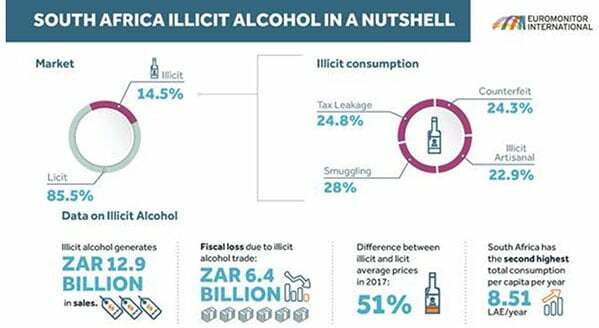 According to the Euromonitor study, consumption of illicit alcohol in South Africa reached 14.5% or 498-million litres of the total combined illicit and licit alcohol volume consumed in 2017. This represents an annual growth rate of around 4.3% between 2012 and 2017. Across the globe, the Euromonitor study reported that 1 in 4 alcohol bottles of alcohol consumed are illicit, representing 25.8% of the alcohol market. The global results include a multi-region report, which compiles findings from 24 countries in Africa, Eastern Europe and Latin America. The difference between illicit and legal alcohol prices averaged 51% in 2017. Due to the year-on-year increases in excise rates over the past 10 years, unit prices for alcohol, particularly spirits, have increased substantially. This high disparity between illicit and legal alcohol costs incentivises illicit activity. It is estimated, according to the Department of Trade and Industry (dti),that the number of illegal, unlicensed alcohol outlets is more than double that of licensed outlets and only 20% of the estimated 150 000 traders in South Africa have attempted to obtain a liquor license. According to the WHO, only 42% of the adult (aged 15+) South African population are consumers of alcohol, yet the country’s annual per capita consumption of 27.1-litres of pure alcohol among drinkers is very high by the international comparison of 17.2-litres of pure alcohol in 2010. On paper, South Africa’s alcohol-related regulatory framework is considered to be strong and includes heavy criminal sanctions. However, in reality, enforcement of existing laws is hampered by a three-tier system of national, provincial and local responsibilities, missing inter-governmental cooperation, and a lack of resources. In an effort to combat excessive alcohol consumption and generate revenue, the South African government has focused on raising excise. As a result, excise duties on alcohol have increased above the rate of inflation since 2002 for beer and spirits over the last 10 years. However, given that illicit alcoholic beverages produced are from unregistered entities, this strategy puts a greater burden on the compliant and registered sector of the industry. Tighter collaboration among government agencies under a simpler regulatory framework. Enhanced enforcement through private and public partnerships for capacity building and training. Creation of an enabling environment to encourage licensing and responsible trading.